A blog about social media, journalism, and public relations. After traveling to New York City last Thursday for an interview, and being unable to access any applications on my brick-of-an-iphone-4, I knew it was time for an upgrade. I recently switched to the iPhone 5s and have found that social media is at my fingertips much faster than it was before. While I was exploring my new device, I logged onto the popular app, Snapchat, and noticed that there was a new feature named “discover” that I had never seen before. I was immediately interested by this new feature and I wanted to find out more. 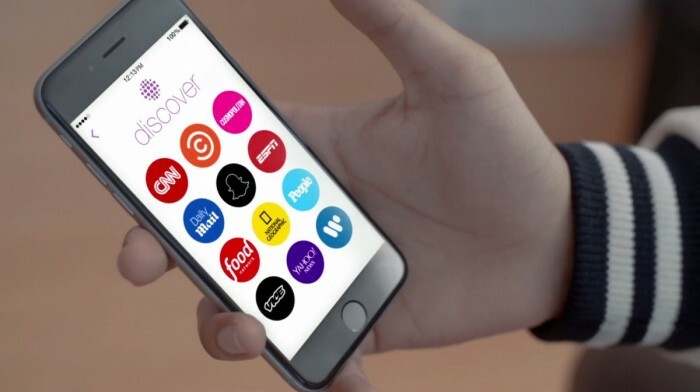 I discovered that on January 27th, Team Snapchat introduced “discover” as its new way to explore stories and post media. Their marketing team saw how much traffic Snapchat was generating from people ages 18-24 and they decided to use it as a way to market news to that demographic. However, instead of building upon an existing structure, such as Snapchat, and formatting news to meet that structures needs, Augenstein would rather start from scratch. He drew up some ideas for an engagement app for the radio station he works for, WTOP. Using the app, listeners can record their viewpoint with studio-quality and instantly transmit it to the newsroom, where a reporter or editor can decide whether to include the comment on-air, online, or on social media. A listener can also contribute a video of the news event he or she just shot on their phone and can send the video and audio to the newsroom with a push of a button. By using this idea, Augenstein introduces another way for people to crowdsource information by encouraging the audience to help write the news. I think both of these ideas for news are revolutionary and exciting, but I also think that people need variety in choosing how they want to get their news. One person might enjoy recording their voice with an app and submitting it to a news organization. But others, may only have time for news by swiping through features like “discover” while they are already on Snapchat and may opt for simply swiping their screen and reading the recently minute-long video that has been prepared to inform them. 1. Stay current with your social media outlets and explore them in detail. Find out all they can do so that you can use them to the best of your abilities. 2. Discover one new aspect of social media a day by playing around on your phone while you’re waiting for class to start, eating at lunch, or waiting to catch a train. You never know what you might discover once you explore the world of social media. What are you waiting for? It’s right at your fingertips! Thanks for the great mention! You’re welcome! Your blog is very interesting and helpful for students like myself who are trying to learn journalism in the technology age.